This course is for anyone required to use ladders as part of their work. Using a ladder and working at height can present many risks to workers’ health and safety if not managed correctly: to be safe, the user must be competent. 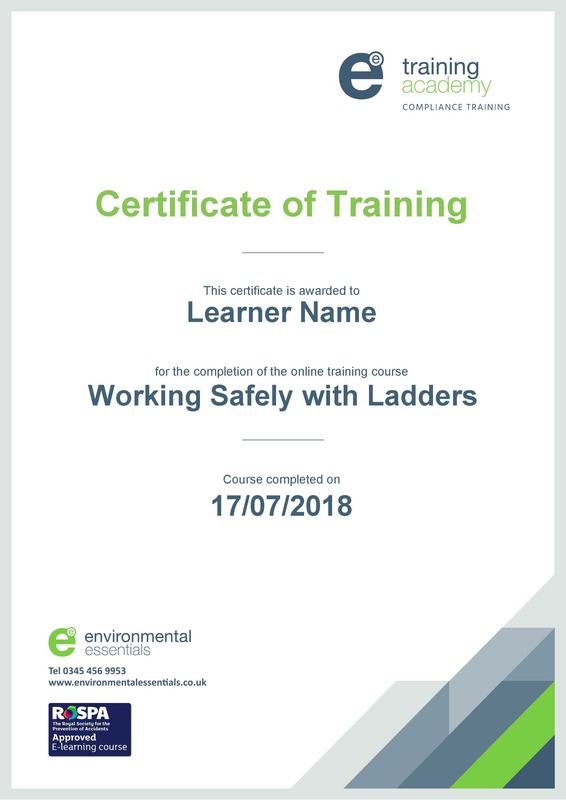 This course provides an understanding of the risks associated with working with ladders, helping you to understand how to manage the risk, how to inspect and maintain ladders safely and how to maintain compliance with relevant legislation. Environmental Essentials Training Academy offers a growing range of RoSPA-approved, online health and safety compliance training courses. The easy to use portal is accessible anytime, ensuring that scheduling is flexible and able to support the needs of your organisation. Reporting tools and expiry notifications enable you to easily manage your health and safety compliance training at every stage. With our specialist support, you can be certain that your workforce will be suitably compliant to safely and efficiently undertake the task at hand. Another satisfied client at a recent asbestos training course... Why not contact us to see how we can help with your training needs!